It is a busy time for the Rotaractors of District 5040. With the upcoming celebration of Rotaract’s 50th Anniversary, and many events and projects, there are a lot of opportunities to get involved! We are looking forward to seeing as many of you as possible on May 12th, when we will celebrate 50 years of Rotaract at Firefighters Public House in Burnaby. A fun schedule with interesting speakers, a silent auction, music, food, and the chance to get to know each other has been set up. Get your ticket now! Two Rotaract Clubs are in the process of getting up and running – a new club at Langara College sponsored by the Rotary Club of Vancouver Arbutus is working on getting chartered and thanks to efforts by District Rotaract Chair Joan Posivy and the Rotary Club of Squamish the Squamish Rotaract Club is making progress at revitalization. We are very excited about this since there can never be too many Rotaractors! Meeting to discussing chartering a Rotaract Club at Langara College. Besides the exciting activities on the District level, the Rotaract Clubs have also been very busy with their own agendas. 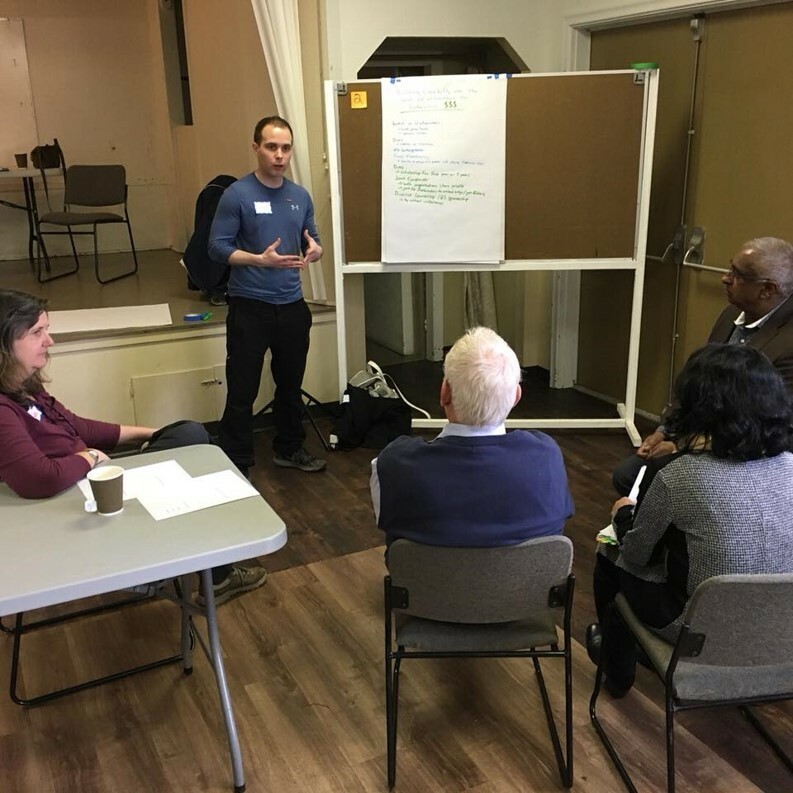 The Vancouver Young Professionals Rotaract Club had their monthly volunteering session at the Salvation Army’s food line on April 21st and took a leading part in the “Establishing a Reliable Membership Pathway” discussion this past March. They will also be helping the YMCA at this year’s BMO Marathon on May 6th and have organized a Great Canadian Shoreline Cleanup on Saturday, May 26th. VanYP’s Thomas Miller at the “Establishing a Reliable Membership Pathway” discussion. The New Westminster Rotaractors held a very successful Charity for Change fundraiser in March and this month were able to send 300lbs of books and textbooks to Atlanta to be shipped to Africa in conjunction with the Books for Africa campaign. On April 30th they have organized a Professional Development workshop, which will focus on improving communication skills amongst members. Besides that, club members are also volunteering to teach kickboxing to people with Parkinson disease at Rock Steady Boxing. Members of the New Westminster Rotaract Club at the Charity for Change Fundraiser. The Burnaby Rotaract Club was able to organize yet another successful Community Dinner at the Burnaby Neighbourhood House on March 18th. On April 22nd they helped out at the Eagle Creek Streamkeepers event, preparing and selling snacks for the volunteers. 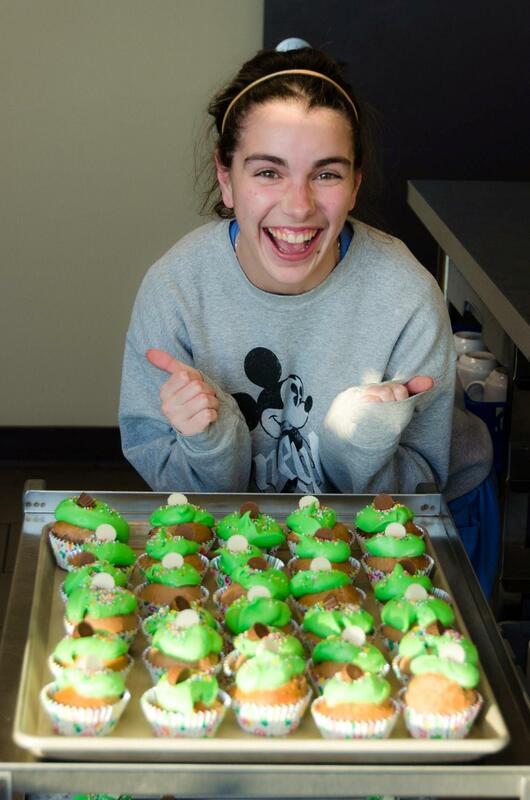 Sarah Kornder from the Rotaract Club of Burnaby with some Saint Patrick’s Day themed muffins. 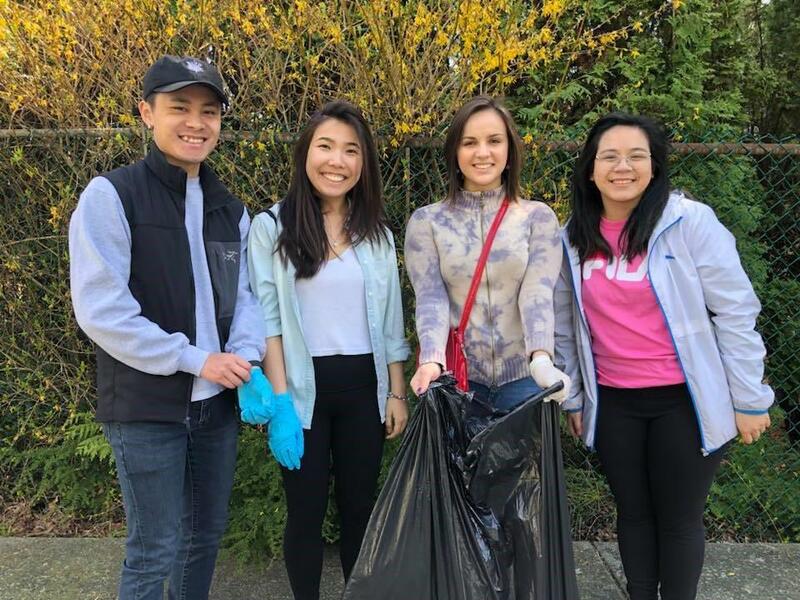 The North Shore Rotaract Club organized a street clean up on April 22nd and is currently focusing on their end of the year presentation to the Lions Gate Rotary Club on May 11th. Members of the North Shore Rotaract Club at the street clean up on April 22nd. This Summer the Rotaract Club of Prince George will be continuing with their efforts to raise money to purchase one Shelterbox. They are halfway there! If you would like to support their cause, please visit their club’s ShelterBox fundraising page: http://ow.ly/jbLV30jAwWh. In the upcoming weeks they will be holding visioning sessions for the 2018-2019 Rotary year. In March, UBC Rotaractors had a successful Burger & Beer Fundraiser for Doctors Without Borders at Coppertank Grill. They also organized a Paint Night fundraiser that took place last week. 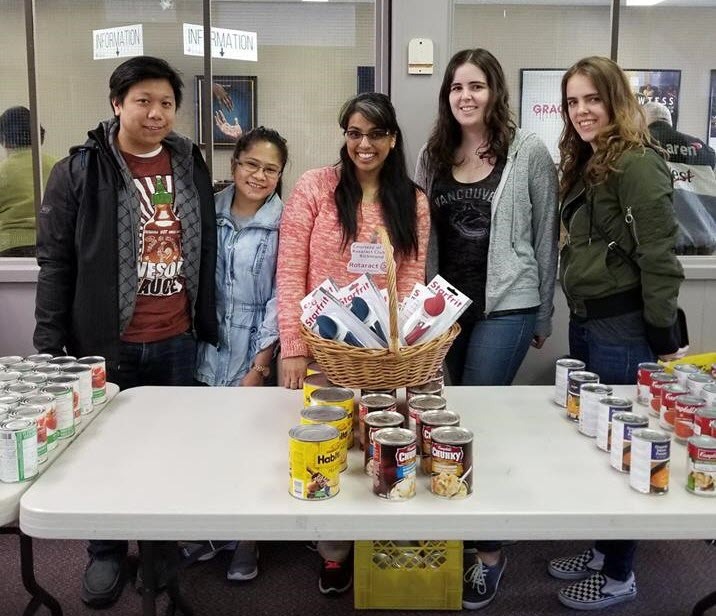 Members of the Richmond Rotaract Club at their Food Bank distribution day this April. The Yaletown Rotaract Club was focusing on helping the Rotarians to prepare this year’s Strathcona Rotary Hoop-a-Thon. It takes place on April 28th at the Strathcona Community Centre. 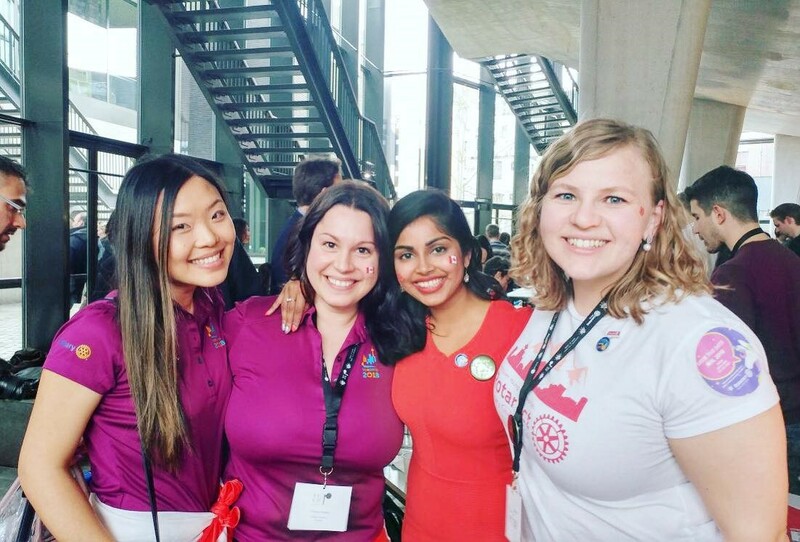 Finally, earlier this month Rotaractors, Falisha Ali and Johanna Johnson, of the Vancouver Young Professionals travelled to Antwerp, Belgium to experience how Rotaract works in Europe at EUCO (European Conference), where 1400 Rotaractors and Rotarians came together to learn, help, and celebrate! 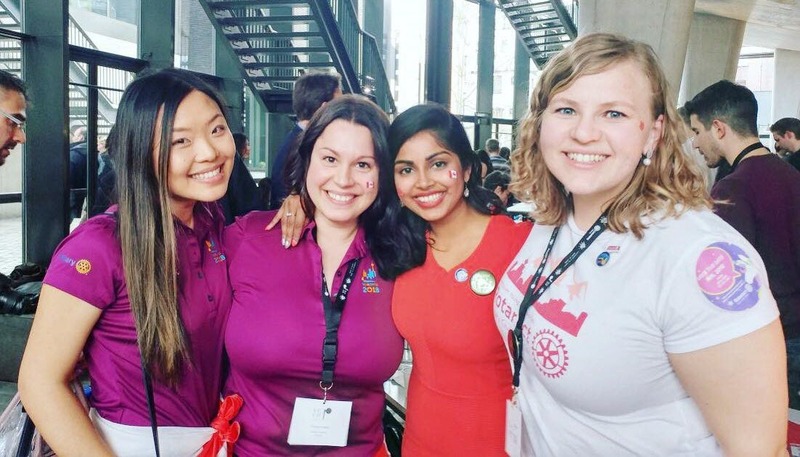 Over the course of 5 days the conference included learning via TED-style talks and country booths, a service project for Rise Against Hunger, and A Diamond Ball in celebration of 30 years of ERIC (European Rotaract Information Centre). The internationality of Rotaract and Rotary is what makes our organization so unique and cool!